Houston finally has its own resident klezmer band! Nov. 13 was a coming out for The Best Little Klezmer Band in Texas. It's a good thing the fire marshal wasn't at the Kaplan Theater because people were hanging from the rafters. People who were turned away missed hearing the 12-piece band roar through two sets of exuberant, earthy ethnic music. 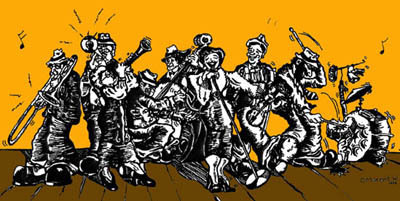 Klezmer is the folk music of Eastern European Jewry. It combines strong elements of Russian and Romanian dance music/ American jazz influences and the "wear on your sleeve" emotion of the Yiddish theater. What you get is a world music that leaps up and grabs you out of your seat right from the first notes of the clarinet and violin. When Marcia Sterling moved to Houston from Chicago early this year, she brought with her the idea for The Best Little Klezmer Band in Texas. Sterling is here because her husband got a position playing the viola with the Houston Symphony. But she's no second fiddle herself. Classically trained since age eight. Sterling holds a master's degree in violin performance. She has been a member of the Maxwell Street Klezmer Band since 1986 and also plays with Frank Sinatra's Chicago-based orchestra 16-18 weeks a year. Armed with a series of scores from some of Chicago's best arrangers. Sterling began scouting Houston for musicians who had the ability to play the scores as they were written. What she found, instead, was more than a dozen musicians who knew and loved klezmer music -musicians who could give the written notes the fragrance and "tarn" (taste) that the music needs to truly live. Consider some of the Best Little Klezmer Band's talent. Clarinetists David Salge and Pamela Bingham capture the swooping and dipping intensity that echoes the Jewish laugh and cry. Upright bassist Eddie Weiner brings a district jazz bottom to the sound. Accordionist Bill Black contributes an Eastern European texture. Recent Russian immigrant and virtuoso pianist Peter Vaysburg anchors the music in authenticity. Percussionist Glen Renfro gives the music such a kick that you can't forget this is essentially dance music even though it might be dressed up in a concert venue. In short/ this is a band capable of giving the music the rhythm, harmony, color and form that it needs. Out in front/ singing, playing the violin, cajoling the band members to put a little more zetz in the rhythm is Marcia Sterling. She has brought this band to life, given it movement and voice. Now it is poised to achieve real expression. The Best Little Klezmer Band in Texas is capable of achieving a vitality beyond nostalgia as evidenced by the technical expertise of the band members. This is essentially dance music/ music that you feel. To see the band in concert is one thing. To experience it in a club venue where you can get up and move to the music is quite different. The music has an earthy, high energy feeling. It can be understood by anyone who has ever been inspired by Eastern European music." Club venues are where The Best Little Klezmer Band belongs. Houston is not Odessa (we're talking about the Balkan location). But like its roots in the underworld taverns of Odessa/ klezmer is ultimately a music that has a greater affinity for smoky clubs than the concert hall. It's a music waiting to be discovered by a generation used to world music, a generation who recognizes authenticity comes in all languages and masters. Sterling proved the band has authenticity by moving the large number or Russian immigrants in the audience to sighs/ laughter and a torrent of rhythmic clapping at the close of the Kaplan Theater concert. It didn't matter that some of the audience couldn't understand the Yiddish lyrics of some of the songs. The evening demonstrated that klezmer music has a vitality that goes way beyond nostalgia. It has the power to speak directly to our innermost celebrations of life. And make no mistake about it: The Best Little Klezmer Band in Texas is a celebration! Thank you again. It was just perfect. We all love your band. The "joyousness" of your music is still with us, and our guests are still calling to thank us for hosting such a wonderful evening. Thank you, too, for leading our guests in the special wedding dances, and for all the warmth and humor your schtik added to our celebration. Simply put, you and your superb band made the party. Thank you from the bottom of my heart. You all were absolutely amazing! You certainly made a hit with our guests; they’re still calling with compliments to the band. Everyone loves your music, and we love the way you guys kept the action going from beginning to end. We appreciate how you coordinated each musical selection with every phase of our party. You’ve got a knack for bringing it all together with joyous results. In our eyes, you are the best! Rather a belated note to tell you thanks for the great job you did at the wedding January 18th--I had lots of compliments from my friends on the band and several people told me it was the best wedding they had ever been to! You guys certainly helped to make it fun and an event we'll always remember. (Especially nice job you did on the solo.) My favorite comment was from one of my Jewish friends who said it was a real treat watching those nuns clapping their hands and tapping their toes to the klezmer music! Yesterday we watched the wedding video and we realized what a centerpiece your band was, bringing out such spirit and participation in our willing guests. We could see you put your hearts into your performance and the audience responded with equal vigor. I know the bride and groom were thrilled with your efforts and we all were only sorry the evening flew by so fast. We send you our heartfelt thanks for going beyond the call and making the wedding reception the success that it was. And thank you, too, for the beauty your music added to the wedding ceremony. We wish you continued success and we look forward to seeing you and the band at Agudas Achim Israeli Festival in San Antonio again next year. What a wonderful wedding! And we owe the largest part of the party's success to the ambiance provided by your band. We keep hearing from people who thoroughly enjoyed all the dancing! We look forward to having you play at our anniversary parties. We just wanted to express our thanks again to you and your wonderful band for making Stephanie and Aaron's wedding so beautiful. Our guests all raved about the band and the food...in that order! The music was truly great and dancing to the oldies was so much fun! We were especially impressed by how gracefully you made the evening flow. It all ended too soon. I know you perform at hundreds of weddings each year, but with all the personal attention you gave us, from the early planning stages to the final dance honoring the parents and in-laws, you made us feel very special. What a fabulous job you and your band did at Karen and David's wedding! We all had a ball and our guests could not stop raving about your music. Thanks for making our simcha even more special and fun than we could have imagined. What a PERFECT band you've got! The reasons must be obvious why we've invited you to be a part of our last three simchas! And we look forward with eager anticipation to having another celebration where we can once again show you off to our friends. Our guests from D.C. are lamenting the fact that your counterpart doesn't exist in their neck of the woods, so they plan to bring your wonderful band to Washington for their daughter's bat mitzvah. Thank you for the party of a lifetime. We want you to know that the Best Little Klezmer Band was spectacular and everyone thoroughly enjoyed your spirited, upbeat music. You helped make our celebration very special. Marilyn and Shang were great. Hannah had a great time, and she loved the special song from Gigi you presented in her honor [Thank Heaven for Hannah Low]. Once again, thanks for everything you did to bring us together in rejoicing. Wow! That's about all I can say (well, not all). It was a fabulous party and you and your band were largely responsible. You are, in a word, T'RIFFIC! You guys can play anything and it all sounds wonderful - with such a large sound - like many more pieces than you are. You, in particular, are a super Ms-tress of Ceremonies. We loved everything from the wonderful combo playing at the reception to your impromptu Havdalah to the rousing first hora set. The soft music during dinner was beautiful and created a special warmth. And we never once had to compete with the music to be heard at the dinner table. You captured the kids’ imagination with fun music and games they could relate to. And you succeeded in getting young and old alike out on the dance floor enthusiastically joining in the Jewish group dancing. The band played a wide mix of music throughout the evening, making sure there was something for every taste. We especially like the Big Band Swing and Latin dances. We at Brith Shalom love you and your fantastic band. May you enjoy continued success. We know that you and the klezmers will bring others as much nakhes and joy as you brought us. Ron and Joan Portman, Houston, Tx. Thank you for the terrific music! All of our guests remarked about how wonderful your band was and were effusive about the joyous spirit you all lent to our simcha. Please thank the band leader for his masterful transitions through each phase of our party making the whole evening flow smoothly. And a personal thanks to you for the many weeks of planning that helped make our Golden wedding celebration such a stellar event. band at our next simcha. We have only three words to say about the music you and your Klezmer Band and Swing Orchestra provided for our 50th Golden Anniversary Celebration: "YOU WERE SUPERB!" We can say unequivocally that your music made the whole evening absolutely perfect for us. In fact, if we had to pick the one thing that truly made the evening so great it would be your wonderful band. Thank you again. Your music made our evening perfect. You touched our souls. Thank you. My wife and I saw the band's performance in Indianapolis and it was fabulous. Our dear friends in Houston sent us your CD. I ordered twelve more! We look forward to seeing you perform again. Let us know where and when. Thank you very much for recording Schleppin' West! I thoroughly enjoyed listening to your foot-stompin' songs filled with Jewish vitality. Your band is truly "one of a kind" and represents authentic sounds of European Jewry. I will always cherish the tape in my collection. Toddah Rabbah & the best wishes for much success in the future. A note of thanks to you and your wonderful band for the grand performance at Dora’s 90th birthday celebration. We all had a great time, especially Dora who spoke about the party for weeks afterward! You and the Klezmers were a delightful treat for her. We thank you more than words can express. What a treat your Schleppin' West CD is! Listening to it made the ride to and from work absolutely painless. The mix of contemporary and traditional music is terrific. And, your voice is fabulous. Inasmuch as Chanukah is nearly upon us, I could not think of a better gift for those who appreciate klezmer, as well as those who have not yet grown to love it, than your CD. Therefore, I would like to order 12 CDs to spread the word here in the Midwest.